Regardless how beautiful, flying a PPG in winter time is quite a challenge. I have been struggling for years to find the right equipment. I usually wear many layers of clothes under my ski overall and with very good results. The only big inconvenience occurs when after 15-20 minutes my hands and especially the fingers get so cold that I can not steer or feel the throttle very well. Over the years, I have gone through many, many gloves. None of them were comfortable and warm enough. When the temperatures fall below 30 degrees F, regular gloves (five fingered ones) are a must but not enough. During my last visit at Bruce Brown of Ohio Powered Paragliding in December 2002, (www.flyohio.com) I was amazed that after 45 minutes when I had to land because of the cold, Bruce told me he could have flown at least another hour. The temperature was 16 degrees F! When I told him my fingers were stiff, he just smiled and shook hands with me (without gloves) His hands after 45 minutes in the air, were warm! Then, very politely and with a mysterious smile on his face, Bruce showed me his secret. 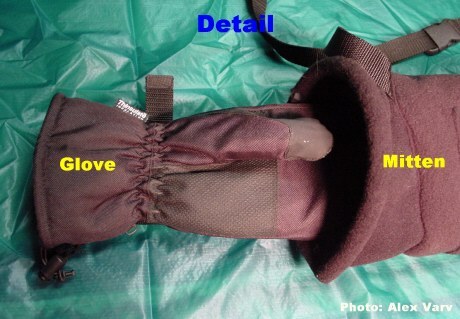 A pair of three fingered snowmobile gloves. They weigh 4 grams each and are specially insulated with the well known "Thinsulate" insulation. 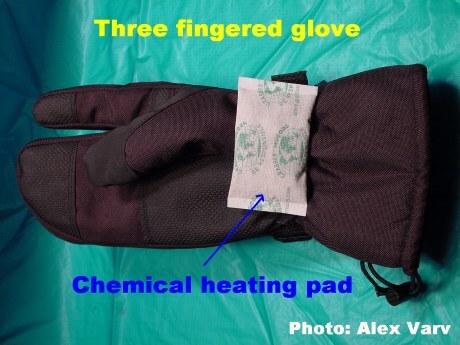 Bruce also uses the chemical hand warming pads which cost about a dollar a pair. 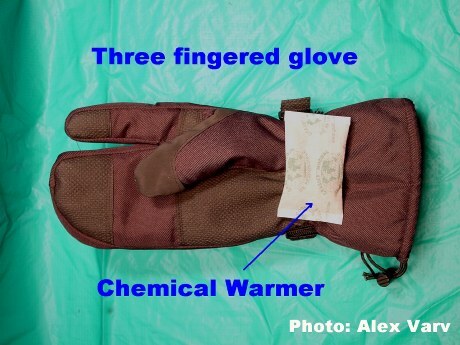 The secret of these gloves consists in the fact that they have three fingers. The thumb, pointer and a mitten for the rest of the fingers. The pointer can perfectly operate the throttle, the thumb holds the risers and the mitten with the other fingers, holds the brake toggles. Having a bigger volume inside with more room, the mitten part together with the chemical warmer protect the fingers for a very long time. Bruce bought these gloves in a general hardware store in Perrysburg Ohio. As soon as I receive more info about this store, I will update this material. The gloves are quite soft and allow the pilot to get used to them very soon. After two failed forward inflations with my EDEN 2 wing, I got accustomed with the feel and I could inflate almost as well as in the summer time with no gloves. Additionally, Bruce uses a mitten for very long flights. If the conditions allow, he lets the brakes go and setting his Bimax throttle to cruise, hangs it to the harness. Next, he puts his hands in the mitten and he can fly for hours. a pair of three fingered gloves and a mitten. We had many warm and happy flights together after it. I never complained about cold in my hands. These gloves are sold by Andersons General Store in Maumee, OH near Toledo at 419-891-2700 . Please and ask for the clothing department. 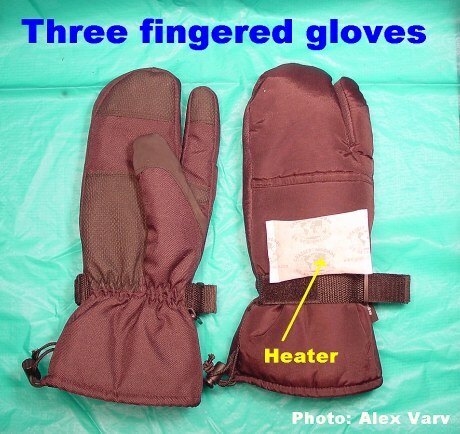 The gloves are knows as Grand Sierra SNOWBOARDING MITTENS WITH INDEX FINGER (part no RN76506) and the cost is $9.99. 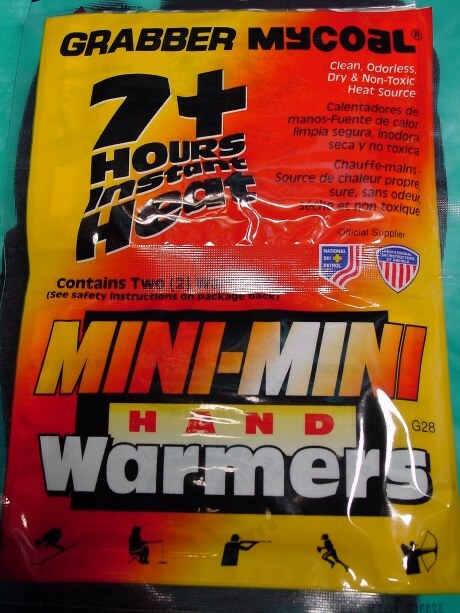 They also sell the disposable one-time-use hand warmers by Grabber for about $.99 a set of two. Excellent articles.